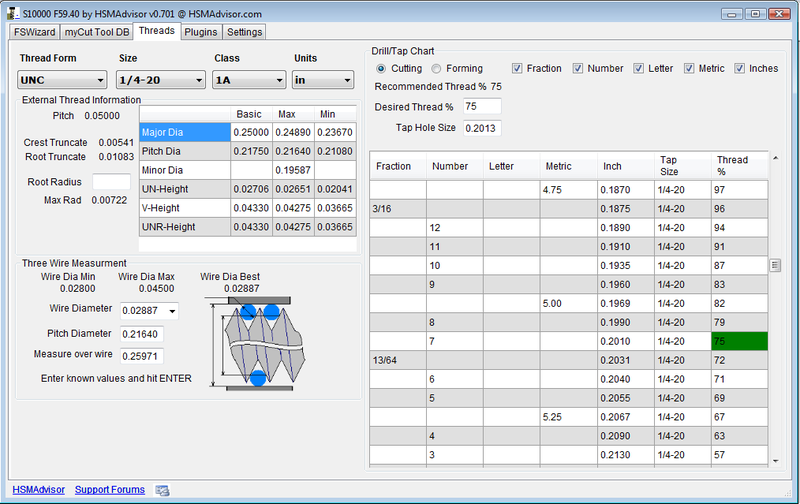 Feature HSMAdvisor HSMAdvisor Lite FS Wizard Mobile Competitor "G"
Made by a professional CNC Programmer/Machinist for CNC Programmers, Machinists and Hobbyists of all levels alike. Save Time and Money by streamlining and standardizing machining decisions. Get ready-to-use cutting parameters that take less time and effort to produce and require minimal operator attention during program proofing and machining. Optimize your productivity by comparing how changes in cutting speed, feed rate and depth of cut affect cutting forces and tool life. 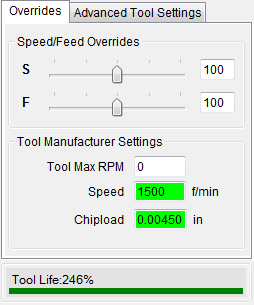 Protect your machine tool by mapping spindle Power Curve and setting limits on spindle torque and maximum feed rate. Turn your second year apprentice into a seasoned veteran who would not try to cut hardened steel as if it was aluminum! 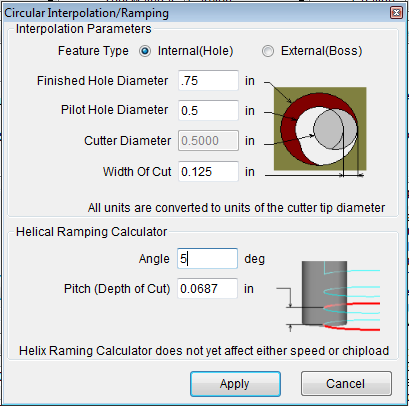 Help your experienced machinists optimize cutting parameters and preserve their knowledge for future use. 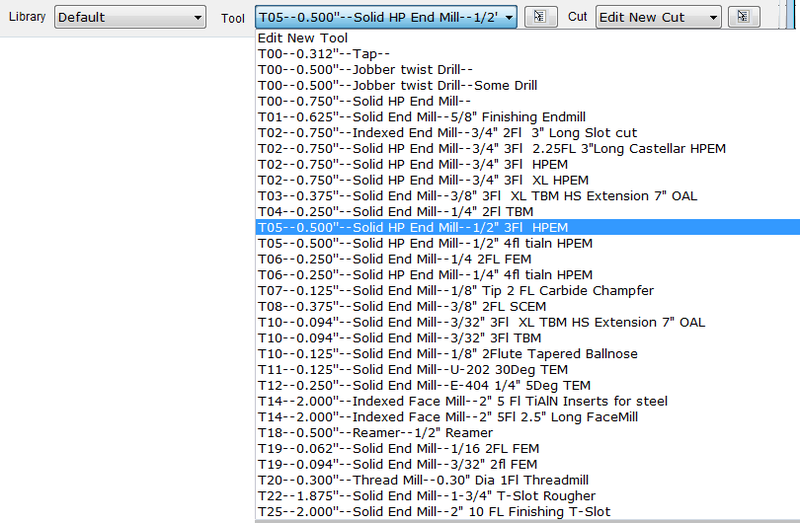 ♦ Large number of milling, drilling and turning tools is supported. ♦ Most of modern cutting materials, coatings and their combinations is available with a click of a mouse. ♦ Cutting Depth and Width are automatically calculated for each tool in accordance to endmill geometry and material being cut. ♦ Change in either Depth or Width of Cut forces the other value to change accordingly to keep load on tool the same. ♦ Change in both values forces feed rate change. ♦ While HSM (High Speed Machining) techniques often put tooling and machinery on the edge of their capabilities, HSMAdvisor allows you to set maximum tool/machine loads to a comfortable for your case level. ♦ Whenever one or more of safety levels is exceeded a warning is triggered pointing the source of the problem and possible ways to fix it. ♦ Chip Thinning and HSM switches allow to account for effect of reducing chip thickness as radial depth of cut is reduced below 30% of the cutter diameter. And maximize cutting speed and feed rate. ♦ To accommodate variations in quality of tooling and machine rigidity, a Tool Performance slider was introduced. It allows to gradually decrease or increase level of tool/material load to achieve optimum performance often exceeding manufacturer-recommended parameters. ♦ Break-Thru and recommended pecking amount are listed for each drill type according to its tip and flute geometry. 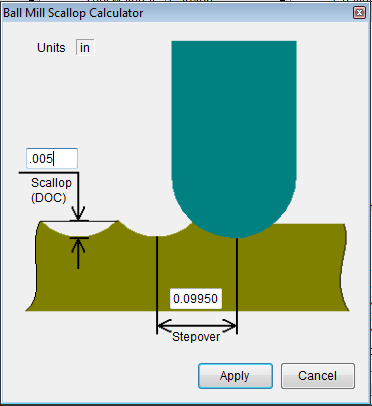 ♦ Scallop calculator for Ball Nose End Mills quickly converts step-over to scallop height and vise-verse. 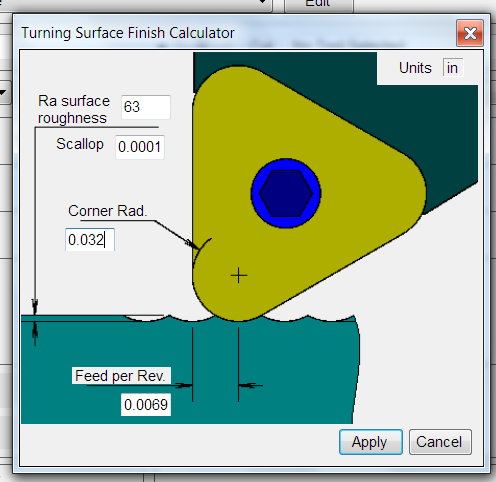 ♦ Turning Surface Finish Calculator estimates and adjusts feedrate to get desired surface finish. 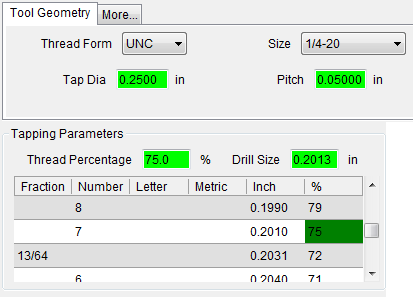 ♦ Latest addition - tapping module specifies recommended drill size. ♦ A convenient table allows to quickly find suitable substitute for any drill size in either imperial or metric. ♦ Manufacturer Settings allow to specify exact recommended tool manufacturer cutting speed and chip load for each particular material. 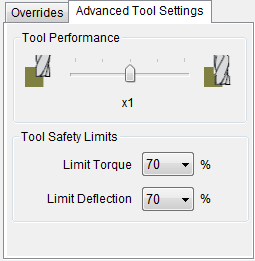 ♦ Advanced tool settings allow to change aggressiveness of the cut and limit cutting forces to a acceptable level. ♦ Machine Spindle power output varies with RPM. Using Machine Definition dialog users can map their machine's Spindle Power Curve and prevent dangerous spindle stall conditions that lead to crashes. 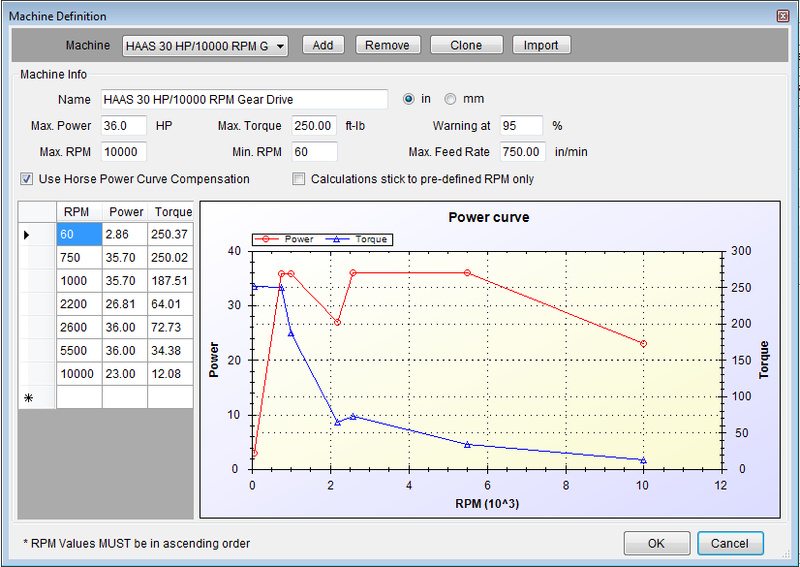 ♦ By checking "Calculations stick to predefined RPM" box user can force calculated RPM to always round towards the closest RPM value from the power curve table. Thus supporting machines where spindle speed changes are made by means of swapping pulleys or changing gears. ♦ HSMAdvisor Cloud allows you to download and upload machines stored on the Internet. ♦ Cutter geometry can be quickly saved into one of multiple libraries for convinient re-use right when you need it. ♦ Some users choose to sort tools according to machine type. Others - according to material type being cut. 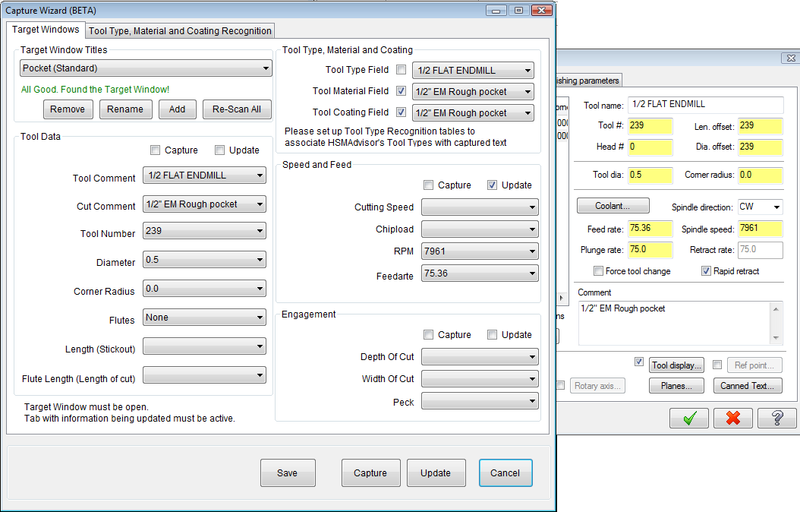 ♦ Each saved tool entry can have unlimited number of Cuts attached to it. ♦ Cut is a workpiece-material related data like Cutter Engagement and any possible overrides that affect resulting cutting speed and chipload. 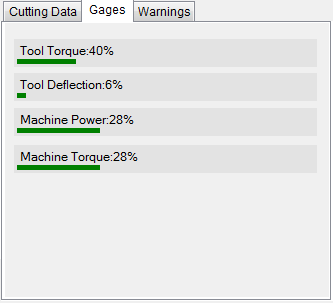 ♦ Gages tab shows most important cutting data at a glance. ♦ Tool Database stores all tooling and associated cutting data in one place. ♦ User can Copy, Move, Delete and Merge Libraries and tools alike. ♦ Using "Actions" Button you can import and export Tool Libraries to and from HSMAdvisor for easy sharing and back-up. ♦ Tool Database can be shared across several HSMAdvisor seats running on a network. ♦ Included Tool Management options allow to keep track of stock, create Purchase Requests and Re-stock tools. ♦ At a later stage it will be possible to synchronize Local Database with an online cloud storage allowing multiple programmers from around the world to have access to the same knowledge base. ♦ Threads Tab shows specifications for major internal and external thread types. ♦ Three wire measurement allows use of both predefined and available wire sizes. ♦ It also lists Minimum, maximum and Best wire size for each thread size and class.